Western style tattoos are a popular form of body art. They have that old school tattoo look about them. They are usually a black outline with filled with color and little or no shading. The colors are predominantly red and green with occasional touches of blue, purple, yellow or brown. Tattoos came to the western world in the 1600s when sailors returned home from the South Pacific bearing ink from the places they had traveled. Islands in the South Pacific each have their own tattoo methods which include similarities as well. The designs and patterns have different meanings, but the method of using sharp pieces of bone or thorns to pierce the skin and inject the ink. Some of the sailors also learned this art, and by the 18th century, many English ports had at least one resident tattoo artist. The first patented electrical tattoo gun was created by a New York Tattoo artist named Samuel O'Reilly. So began the history and popularity of western tattoos. Many of the western style tattoo designs come from nautical references because of the influence of the early sailor tattoo artists. Nautical stars, ships, and mermaids are common subjects for these types of tattoos. Animals such as snakes and swallows are also common themes in western tattoos. 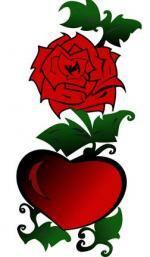 Hearts, animation characters, flames, skulls, and roses are all also popular designs for western tattoos. Daggers and swords can also be found as elements in the simple, nostalgic style of western tattoos. Many tattoos contain banners bearing the names of loved ones such as "Mom", or the name of the girl back home. As the use of banners evolved they also bear special dates or phrases. 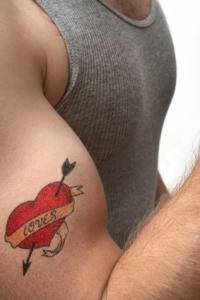 When one talks about western style tattoos, usually the first name that comes to mind is Sailor Jerry. There were many great artists before him, but he is the one that most people recognize as a giant in this type of tattoo design.Like the sailor tattoo artists before him, Jerry joined the Navy as a young man and sailed to the South Pacific where he learned about Asian tattoo art. He opened his first tattoo parlor in Honolulu's Chinatown and became a tattoo legend. His artwork now graces not only skin, but handbags, t-shirts, wallets, and other fashion items. Tattoo design is becoming classic. To learn more about Sailor Jerry, there is a great book available called Sailor Jerry: American Tattoo Master. It can be hard to find, but is a great read if you can get your hands on a copy.